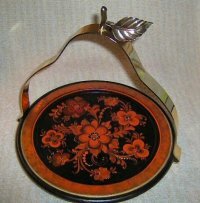 This lovely plate with gripper handle is painted in a style called Raumsaumalingen (Red Embroidery painting). The handle comes off for storage and is a pretty polished gold finish. The plate has a glass liner that sits up off of the surface and protects the painting. It measures 10 inches. The plate sits up on four small feet.